I mentioned in my last style post that I've been in a bit of a style rut, and that I'd been thinking about embarking on a challenge of some sort. Since I've also been wanting to shop more ethically, I decided that for the next 6 months, I'm going to challenge myself to only shop secondhand for clothing, shoes, and accessories. I started my challenge at the beginning of the month, and since I had a little credit to ThredUp (plus a 20% off promotion going on), I decided to kick it off with a little secondhand haul. I love a good shopping review post, and even though you can't necessarily buy these exact items, I still thought it would be fun to share my ThredUp box with you. Talbots plaid scarf - $12.80. 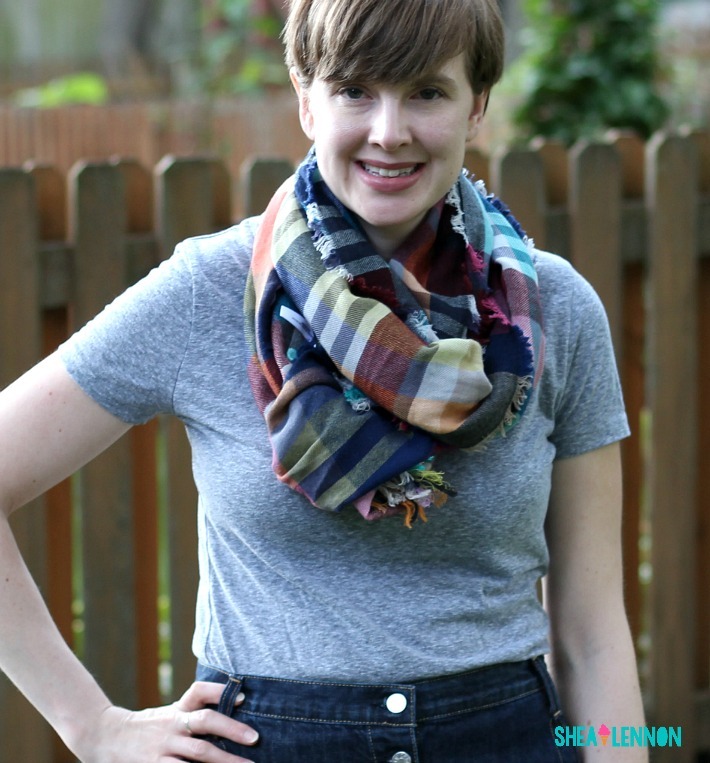 I have a couple of plaid blanket scarves that I wear a lot in the fall, and I love the pretty jewel tones in this one. It's also a little smaller than the ones I have so it will be more versatile on days it's cool but not freezing cold. 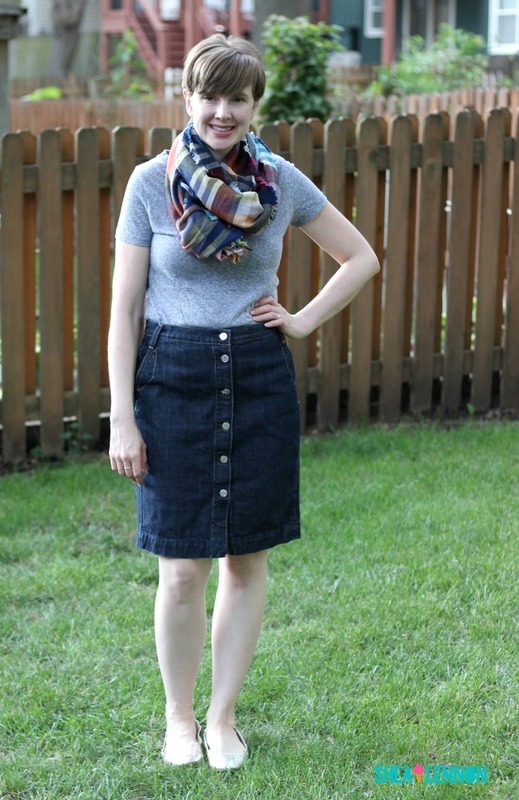 J.Crew denim skirt - $18.36. This skirt is what got me started on this little shopping extravaganza. I've been on the hunt for a denim skirt for quite some time, but I hadn't found exactly what I wanted until I saw this one. I love the button-up style and the dark denim color--it will be perfect for fall and pretty much all year round. Loft navy print blouse - $16.80. I seem to have a thing for navy blue print blouses, as I already have a few, but I love the subtle but unique ruffled sleeves of this one. 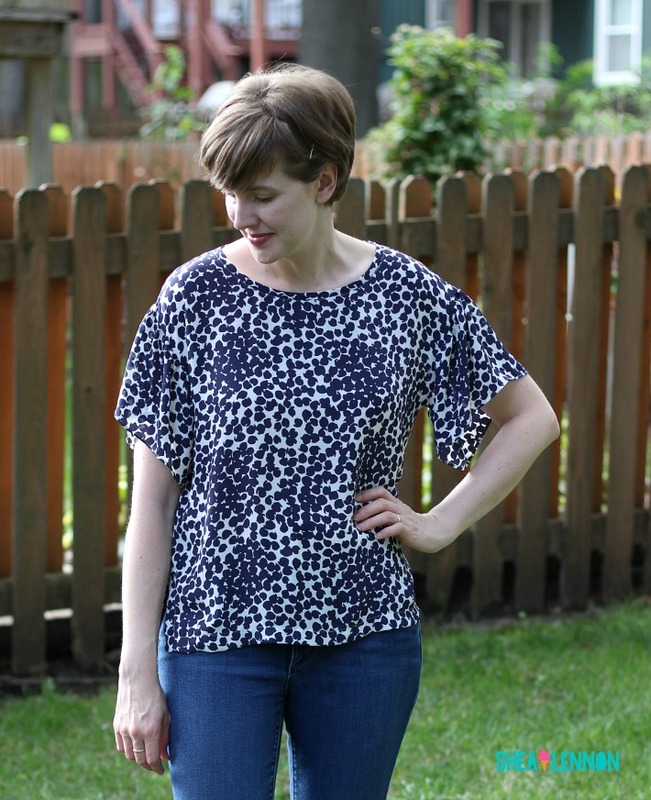 I'm all about easy outfit formulas these days, and one of my favorites is jeans with a pretty print top. It's no more work to put on than a tee shirt, but it feels a little more special. 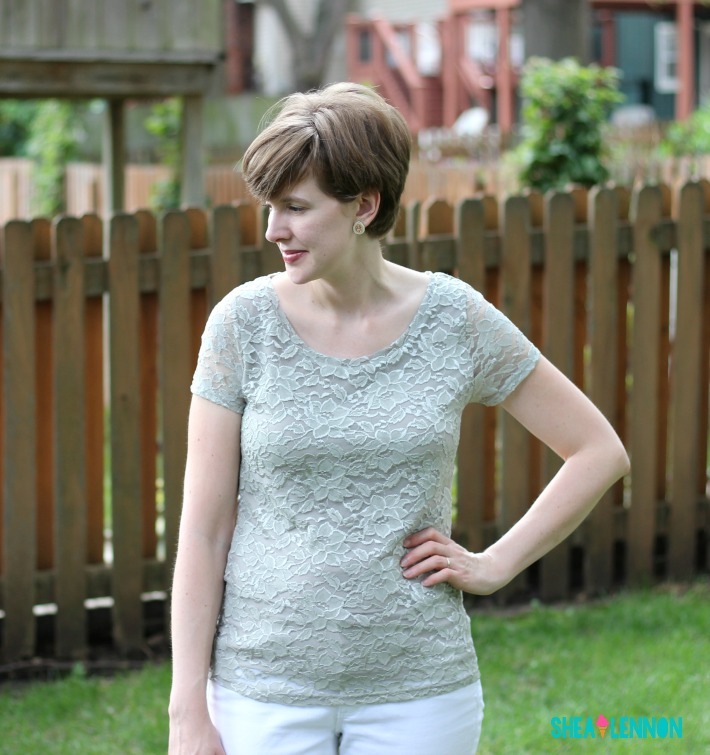 Banana Republic lace top - $16.00. A lace tee is something else I've been wanting in my closet. I like the idea of a dressy fabric done in a casual way. However, this one isn't quite right. It's too fitted for my taste and I don't think it's very flattering on me. This one will be going back, and I'll hold on to the store credit for next time. 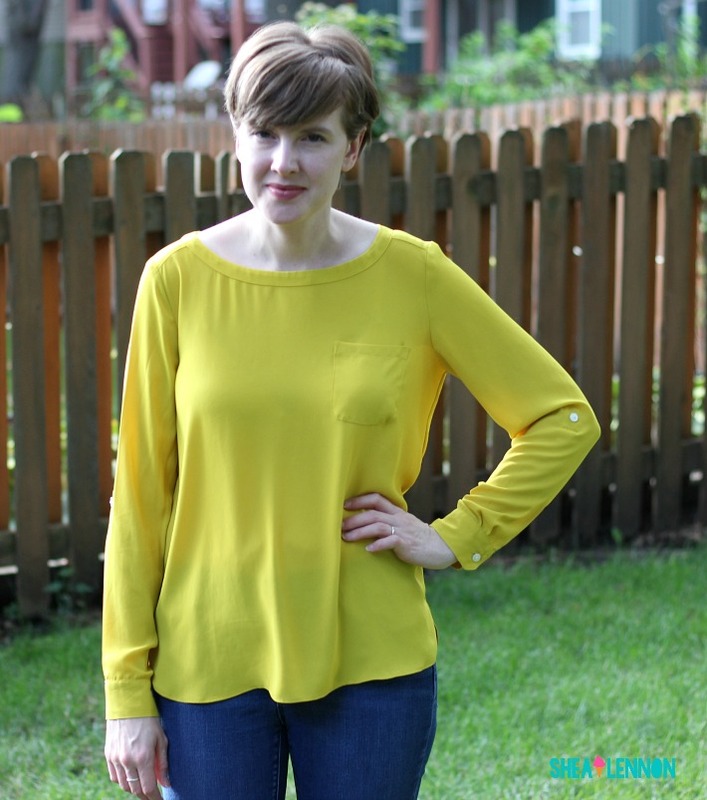 Loft long sleeve yellow blouse - $ 19.20. One thing I think Loft does really well is blouses, and I remember seeing one like this on a few bloggers and really liking it. I never used to like yellow on me, but it's grown on me in recent years. It really feels like fall! Have you scored any good thrift finds recently? This post does contain referral links - if you use my ThredUp link to sign up and make a purchase, we will both earn $10 off our order. Linking with Pumps and Push-ups and Straight A Style.